http://www.sticklibrary.com Simon Philips performance from Drum Fest 2009. 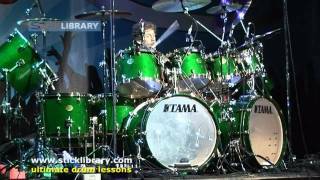 Sticklibrary filmed drummer Simon Phillips at the Drum Fest 2009. For the Full Simon Phillips drum solo head to sticklibrary.com and selected the features option where you'll find all the features available to watch. Simon Phillips has drummed with a long line of bands including Toto, The Who, Judas Priest, Michael Schenker and many more.